The on-chip multitasking should simplify robot sensor control and the Basic/Flowchart programming is WAY-cool! I used to (3 weeks ago) dismiss the PICAXE as just another hard-to-use, popular chip. Then I randomly found out that they can be programmed with a flowchart and I was like "AAAAA!!!!! AAAAAA!!!! AAAAAAAAAAA!!!!!!!" so now I'm gearing up to get started! 11 cheers for binary! and randomly finding awesome stuff! Yay! Hooray! I like this chip a lot! It's turning into the Swiss Army Knife(tm) of MPUs. Their support forum is a great accessory for idiots like me, btw. You're not just buying a chip, you're buying a consortium! Picaxe has become my MCU of choice. 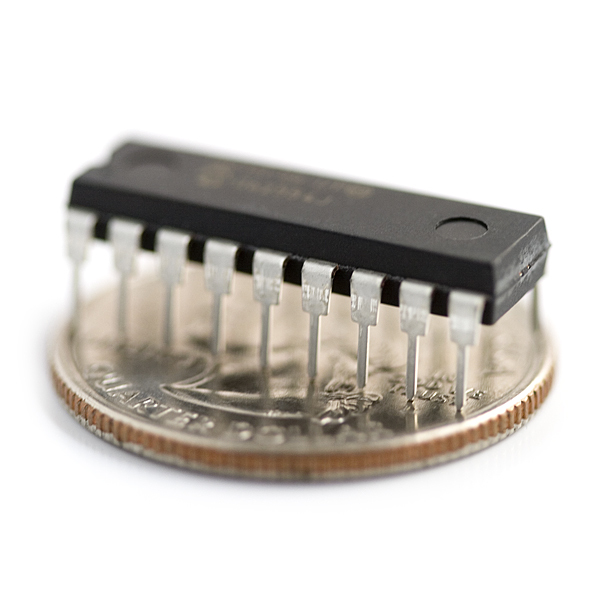 These little guys are so cheap, so capable, so easy to program, and require nearly zero additional components to program or integrate into circuits. The development suite is pretty great too, but having to do manual memory management is a pain sometimes. That being said, once you write a couple of memory addressing algorithms, it's not so bad. Am I reading the datasheet right that this chip can control 8 servo's? could these be used to control things like a timer? There is a timer function - is there anything specific you'd be looking to do, though? Is there anyway you guys could make a schematic symbol and PCB footprint for the eagle library? You can find it in this library. Can anyone confirm what firmware version these are shipping with? Version 1 had some problems with word addressed EEPROM, which version 2 supposedly fixed. I see that your almost out of stock, hopefully new stock will be v. 2. 4 parallel tasks!? Pretty neat i must say, I've already loved picaxe, but now i have another reason to. Speaking of the Propeller, have you seen the working specs for the P2? Look out Arduino, we're going to go for a Spin! I use Picaxe mc to animate features on my garden railroad. For simple features like an oil pump jack, the 08M series works fine. For more complex features such as a fire station with an overhead garage door, a fire truck that moves in and out with flashing red light and working headlights, I use the 18M series. The ability to control multiple servo and stepper motors from a single mc and all the other features makes it ideal for my projects. Programming in BASIC makes it simple and the Picaxe editor allows me to test my programs even before I get the 18M out of its box. I started using Picaxe mc after using Basic Stamp 2sx at $60 a chip became too expensive for projects on the garden railroad. At $5 per chip, I can by 12 18M mc for the same price. New to this stuff and bringing my Ho scale amusement park to life! Item worked as expected and prompt delivery. Put it in a drawer as it took 12 days to receive it. I ordered another from Ca. and got it in 3 days. Still FedUp with FedEx.